The biological meaning of the cellular nutrition, reproduction and interaction. Cellular nutrition (I): membrane transport of substances. Cellular nutrition (III): the metabolism; anabolism and catabolism in autotrophic and heterotrophic beings. Cellular reproduction (I): the cell nucleus: DNA, chromatin, chromosomes; haploid and diploid cells. Cellular reproduction (II): the cell cycle. Cellular reproduction (IV): the stages of mitosis; its meaning and role in eukaryotic cells. Cellular reproduction (V): meiosis: main events; its meaning and role in eukaryotes' gametogenesis. Cellular interaction: biological meaning and examples in prokaryotic and eukaryotic cells. Genetic material In all cells the genetic material is DNA bound to proteins and organised in chromosomes. Bacteria have one chromosome, while humans have 46 in each cell. Its function is to store, express and transmit to the offspring the instructions that tell how every cell and living being will be self-constructed and how will they work. Mitosis Cells with more than one chromosome, once they've synthesised a full copy of the whole set of chromosomes, have to carefully organise their division in order to produce two daughter-cells with exactly the same genetic information. 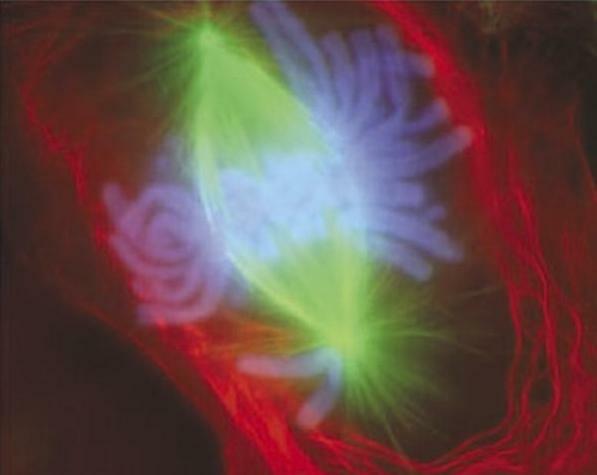 Mitosis is the complex process whereby most eukaryotic cells tackle such a task. Cell functions.Membrane transport, cell nutrition and cell reproduction in an easy-to-understand language. How diffusion works.Animation showing the basics behind the diffusion of chemicals in solutions. 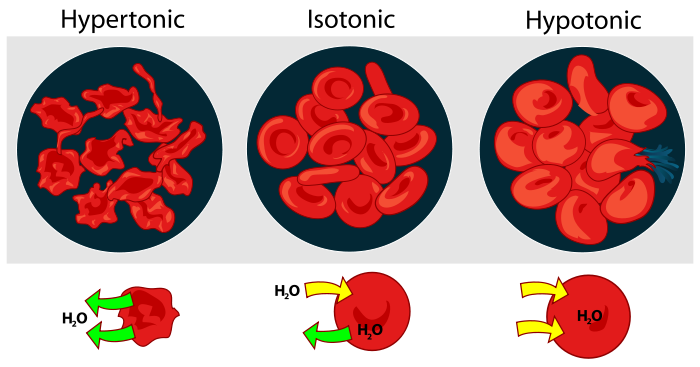 How osmosis work.Osmosis is a special type of diffusion which involves movement of water molecules only. Learn about it through this animation. Osmosis.Advanced video on osmosis, explaining everything you ever wanted to know about it. You may need to switch to full screen mode to prevent overstretching. How facilitated difussion works.Learn about passive transport through an animation that shows how membrane proteins can help specific chemicals to cross by without consuming energy. How the sodium-potassium pump works.Learn about the sodium-potassium pump, the main active transport mechanism. How enzymes work.Animation showing how enzymes catalyse biochemical reactions. Lysosomes.Animation showing how lysosmes are produced and work breaking down big molecular structures for a later use in the cellular metabolism. The cell cycle.Watch this animation to learn the basics of the cell cycle. Control of the cell cycle.A good and comprehensive explanation of the different stages of the cell cycle. How the cell cycle works.Animation showing a detailed view of the cell cycle, including the various steps of cell division. Mitosis and cytokinesis.Step by step animation of mitosis and cytokinesis. Comparison of mitosis and meiosis.Animation showing clearly the different pathways and outcomes of meiosis and mitosis. Learn the structure, behaviour and biological meaning of the cell's plasma membrane. Learn how the molecules of fluids move freely, and which force drives their motion. Learn how the process of osmosis can even out the concentrations of two solutions to either side of a partially permeable membrane. Learn how some proteins of the plasma membrane can allow a free movement of molecules in and out the cell. Learn how some proteins of the plasma membrane can pump certain substances through the membrane against the concentration gradient with some contribution of energy. A more detailed view of the process of active transport through the Na/K pump example. Learn how plasma membrane sacs can help to transport materials in bulk in and out the cell. A more detailed view on the role of the endoplasmic reticulum, the Golgi apparatus and the cell's membrane lipid bilayer in the processes of exocytosis and endocytosis. The mitotic process explained through an animated movie. [Some key words: thread, coil, unwind, spindle, fiber]. The central stages of mitosis in a microscopic movie. Another animated movie on mitosis, this time silent. The meiotic process explained through an animated movie.